One of my colleagues drew my attention to an article in a recent Communications of the ACM, May 2012, vol 55, no 5, (Education: “Programming Goes to School” by Alexander Repenning) discussing how we can broaden participation of women and minorities in CS by integrating game design into middle school curricula (Thanks, Jocelyn!). The article itself is really interesting because it draws on a number of important theories in education and CS education but puts it together with a strong practical framework. There’s a great diagram in it that shows Challenge versus Skills, and clearly illustrates that if you don’t get the challenge high enough, you get boredom. Set it too high, you get anxiety. 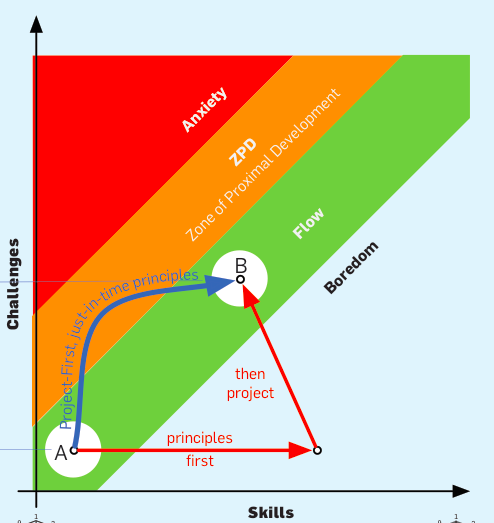 In between the two, you have Flow (from Csíkszentmihályi’ s definition, where this indicates being fully immersed, feeling involved and successful) and the zone of proximal development (ZPD). Extract of Figure from A. Repenning, "Programming Goes to School", CACM, 55, 5, May, 2012. Which brings me to Vygotsky. Vgotsky’s conceptualisation of the zone of proximal development is designed to capture that continuum between the things that a learner can do with help, and the things that a learner can do without help. Looking at the diagram above, we can now see how learners can move from bored (when their skills exceed their challenges) into the Flow zone (where everything is in balance) but are can easily move into a space where they will need some help. Most importantly, if we move upwards and out of the ZPD by increasing the challenge too soon, we reach the point where students start to realise that they are well beyond their comfort zone. What I like about the diagram above is that transition arrow from A to B that indicates the increase of skill and challenge that naturally traverses the ZPD but under control and in the expectation that we will return to the Flow zone again. Look at the red arrows – if we wait too long to give challenge on top of a dry skills base, the students get bored. It’s a nice way of putting together the knowledge that most of us already have – let’s do cool things sooner! That’s one of the key aspects of educational activities – not they are all described in terms educational psychology but they show clear evidence of good design, with the clear vision of keeping students in an acceptably tolerable zone, even as we ramp up the challenges. The ability to create a playable game is essential if students are to reach a profound, personally changing “Wow, I can do this” realization. If we’re looking to make our students think “I can do this”, then it’s essential to avoid the zone of anxiety where their positivity collapses under the weight of “I have no idea how anyone can even begin to help me to do this.” I like this short article and I really like the diagram – because it makes it very clear when we overburden with challenge, rather than building up skill and challenge in a matched way.